Robert Widders served in all three branches of the armed services; the Royal Navy, the Army and the RAF. 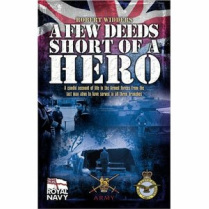 A Few Deeds Short of a Hero tracks his life from childhood through naval service in the NATO rapid response Atlantic Squadron during the Cold War, through Army military manoeuvres in Germany, and active service in RAF Field Hospitals during the Gulf War. "Graphically charts the highs and lows, boredom and excitement, camaraderie and tragedy of military life." "Adventurous is an understatement when describing Robert Widders." "A unique insight into the mind-set of the enlisted man."